Your kids may share a room and toys, but their best friend may have four paws and a tail. A new study finds that children prefer spending time with their pets over their siblings. Researchers from the University of Cambridge found that dogs, in particular, were associated with high levels of satisfaction and bonding and low levels of conflict. Findings from the new study add to a growing body of evidence that finds that household pets can have a significant impact on children’s development. The positive influence of animal companions may even be seen in children’s social skills and emotional well-being. "Anyone who has loved a childhood pet knows that we turn to them for companionship and disclosure, just like relationships between people," said lead author Matt Cassells. "We wanted to know how strong these relationships are with pets relative to other close family ties. “Ultimately this may enable us to understand how animals contribute to healthy child development,” he added. While siblings may bicker, the relationship between kids and their favorite pet tends to be more harmonious. 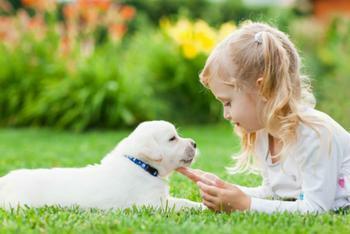 The study found that kids often get along better with their pets than they do with their brothers or sisters. This finding was revealed when the researchers asked 12-year-old children from 77 households with both pets and siblings to talk about their relationship with their pets compared to their siblings. Responses showed that pets -- dogs more than other pets -- provided kids with a low-conflict, high satisfaction relationship. And while girls and boys were equally satisfied with their pets, girls were most likely to feel that they had a friend in Fido. “Results showed that girls reported more disclosure, companionship, and conflict with their pet than did boys, while dog owners reported greater satisfaction and companionship with their pet than did owners of other pets,” the authors wrote. The inability of pets to talk back to their tiny human friends may even be a plus in the relationship, said Dr. Cassels. “Even though pets may not fully understand or respond verbally, the level of disclosure to pets was no less than to siblings. The fact that pets cannot understand or talk back may even be a benefit as it means they are completely non-judgmental,” he concluded.